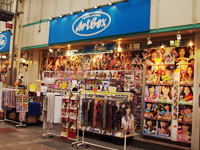 You can find variety of items of your Korean stars and pop idol. Promide, buttons,fan ,key chain, poster and so on. Come and find your favorite idol item. 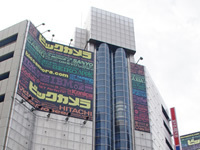 This big electrical store is kind of symbol of Namba.It is known as a shop sells a lot of eco-friendly products. Some products are now 20 % off!Don`t miss it. Looks like an antique shop. 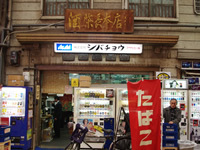 But it is a liquor shop which sells many rare `shochu.`A big vending machine is the landmark to this shop. 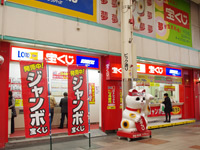 Apparently this shop has many `winning lottery tickets`. All staff are also making wish for you. 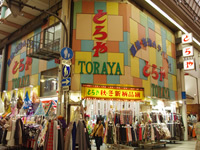 Clothes and fabric shop. from Chemical fiber to organic cotton, they have wide selections. You can also get a small piece of fabric. 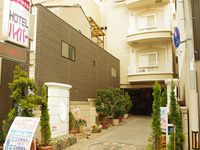 It`s located in the middle of Downtown,Minami. Fashion hotel with all amenities. Renting shampoo is complimentary. Card Members can get even better deal and bonus.